Swimming New Zealand is excited to be assisting with the Water Skills for Life initiative and that this is totally inclusive and made available to all Kiwi children. We believe the competencies have been developed so most New Zealand children can achieve them in some way or form. Educating parents is a part of Swimming New Zealand's education advisers role. We believe it is vital that all kiwi parents know their children's true ability when it comes to skills in the water along with their water safety knowledge and awareness. There's a good chance some of our Kiwi kids can educate their wider whanau on the risks and hazards of local aquatic environments and when they should wear a life jacket. Come along and get essential training for water safety skills for free! 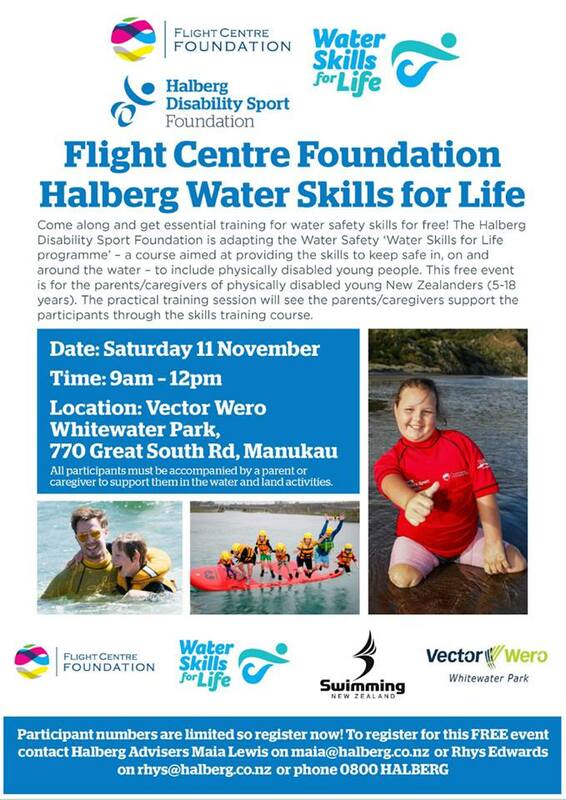 The Halberg Disability Sport Foundation is adapting the Water Safety ‘Water Skills for Life programme’ – a course aimed at providing the skills to keep safe in, on and around the water – to include physically disabled young people. This free event is for the parents/caregivers of physically disabled young New Zealanders (5-18 years). The practical training session will see the parents/caregivers support the participants through the skills training course. All participants must be accompanied by a parent or caregiver to support them in the water and land activities.